Jean Obeid in WikiLeaks: Syria AND Saudi Arabia’s choice? This is the 13th post in a series of monthly posts covering (forgotten/ignored) WikiLeaks cables about Lebanon. If the past two months in Lebanese politics have taught us anything, it’s that a 7 months-old trash crisis can have absolutely no impact on the country’s government while a diplomatic crisis between Saudi-Arabia and Iran can cause panic and chaos among the politicians and almost make them sleep in the Grand Serail in order to reach a solution. Which is why this month’s WikiLeaks post isn’t about who the Lebanese want, or even who the Lebanese parties want (Aoun/Frangieh). This month’s WikiLeaks post is about who the regional countries prefer to be in Baabda palace. One of the names that keeps surfacing in Lebanese media is the name of Jean Obeid (if you have no idea who he is, it’s OK. Wikipedia shall enlighten you). So I went on WikiLeaks, and found out that not only he is a favorite of speaker Berri, but also Syria and Saudi Arabia. How that last sentence is even possible is beyond me, but if he can still gather regional support (the cables are a bit old and mostly from 2008) we should all keep in mind that his candidacy is as serious as Michel Aoun and Sleiman Frangieh’s one. On another note, Obeid seems to have had a French veto on his name (just like Frangieh), could have enjoyed the former Patriarch’s blessing, and could have also been a compromise candidate for Hariri in 2008 according to former minister Murr. Siniora even preferred him on Edde. So when it comes to favorites, I would say that Obeid has regional politics and a deal on his side this time, and he might end up being a sudden / last minute serious threat to both the Frangieh and Aoun candidacies. Enjoy the cables. I picked the most relevant ones and I’ve only kept the parts focused on Obeid and organized them by chronological order. The last two cables are meetings with Obeid, so I’ve copied them all: After all, it’s nice to know how Obeid maneuvers. He might be president one day, no matter how that seems unlikely (when you’ll read the cables you’ll understand that it’s not that unlikely after all), and according to his meetings with Jeffrey Feltman, he’s not a big fan of Michel Aoun. Perhaps it’s why Berri likes him so much after all? “Michel Aoun, he added, does not comprehend the mind of Christians. Samir Ja’ja’ does not comprehend the heart of Christians. President Lahoud is feeding the flames and creating walls, not bridges, between groups.” – spoken like a true candidate for the Lebanese presidency. Poetry. 13. (S) Describing a spectrum ranging from white (good) to black (bad), Emie said that, in his view, former MP Nassib Lahoud and current Minister of Justice Charles Rizk were “by far the best.” He lamented that Rizk and Kouchner had sparred over a lunch hosted by Siniora, when Rizk “was openly contemptuous” of some views of Kouchner that Emie described as “rather naive.” The fact that Rizk speaks “impeccable French” may help to rehabilitate him in French eyes. Nassib Lahoud and Rizk were both “presidential,” with “strategic vision.” At the black end of the scale, to the point of requiring French vetoes should they become serious candidates, Emie placed former Foreign Minister Jean Obeid (“corrupt and a ‘Syrian'”), former Foreign Minister Farez Bouez (“even dirtier than Obeid”), and former Health and Interior Minister Suleiman Franjieh (who, as a personal friend of the Asad family, probably has no chance). 12. (C) The Speaker then wrote out the people he saw as candidates: Michel Aoun was the sole opposition candidate on his list. From March 14, he listed Boutros Harb, Nassib Lahoud, Nayla Mouawad, and Robert Ghanem. Of “neutral” candidates, he listed Fares Bouez, Jean Obeid, Charles Rizk, Michel Edde, Mikael Daher, and Joseph Torbely. Only later in the conversation did it occur to the Speaker (or to the others in the room) that no one had remembered to add Amine Gemayel to the list. Then, of the list of 12 candidates mentioned, Berri started crossing out names, one by one, explaining why this or that person would not be elected. This left him ultimately with four names that he considered to be realistic candidates: Nassib Lahoud, Boutros Harb, Robert Ghanem, and Jean Obeid. He promised that if the US could lead March 14 to accept the two-thirds quorum, he would secure the opposition’s consensus on the presidency, settling on one of those four names (which Obeid known to be Berri’s preference). The Ambassador kept pushing Berri about what was so dangerous about any of those four candidates. Berri did not answer the Ambassador’s question about why parliament could not simply meet and vote on those four names until a winner emerged. 5. (S) At the same time, Saudi Arabia is adamantly opposed to March 14’s proposal to prevent an extension of the status quo by holding an absolute majority (“half plus one”) presidential election. Such an approach will also be destructive to Lebanon and will permit Syrian-backed thugs and gangs to wreck havoc. King Abdullah has instructed Saad Hariri not to move in the direction of absolute majority BEIRUT 00001724 002.2 OF 005 votin. A formula has to be found by which Lebanon avoid both catastrophes, a presidential void or a hal-plus-one presidency. While he believes that hi personal friend Jean Obeid would have been a god consensus choice, Khoja said that he now recogizes that neither March 14 leaders nor the Maronies accept Obeid. “I don’t know why,” oja said sadly; “Jean is good.” The Ambassador did not coment. 13. 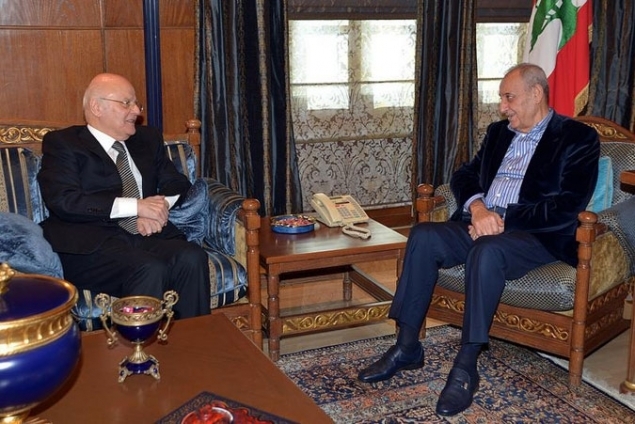 (C) In a separate meeting, the Ambassador briefed MP Walid Jumblatt about Khoja’s thinking. Jumblatt (who earlier in the week had hosted Khoja to dinner, when Khoja was still touting Jean Obeid as president) said that he liked the idea, as “we have to give them (the March 8 opposition) something.” From Jumblatt’s perspective, this accomplished three goals: First, March 14 secured the presidency for six years. Second, Hariri delayed taking the premiership pending a more favorable political and security climate. Third, the compromise March 14 would have to make regarding the PM was far less painful than making a compromise on the president, since the cabinet could always be changed and “improved” later. But Saad Hariri will have to be convinced, Jumblatt said, noting that he would not risk splitting March 14 if Hariri did not approve. 14. (C) The Ambassador mentioned that, on December 30, Deputy Prime Minister and Defense Minister Elias Murr raised — with suitable alarm — the question of a Jean Obeid presidency should the Sleiman presidency be derailed by the methods outlined above. Murr said that he believes Obeid (who was always Nabih Berri’s preference) is now the real Syrian candidate. The Prime Minister confirmed this rumor and said he had heard it from Obeid himself, who declared that the Sleiman candidacy “was over.” In a side-bar conversation discouraging to all, meeting participants debated the merits of Michel Edde vs. Jean Obeid as a back-up candidate. Siniora said that “Edde is a very good liar, but one can find a way to get through to Obeid in the end. Of the two, Obeid is the least worst option.” Asked why Sleiman, once thought to be Syria’s candidate, is now apparently being blocked by Damascus, Siniora explained that it is because Sleiman is “entering through the March 14 gate” rather than via Damascus. By contrast, Obeid would come to the presidency via Damascus. 12. (C) Answering the Ambassador’s question about whether the pro-Syrian foot-dragging on Sleiman was intended to block him or just gain more concessions, Murr said that he was convinced the Syrians truly do not want Sleiman. Citing contacts of his father Michel (who has long maintained a close relationship with Syria), Murr said that he has increasing evidence that Syria’s Lebanese allies, surely reflecting Damascus’ thinking in his view, now want former Foreign Minister Jean Obeid as president. (PM Siniora, as noted ref a, has told us the same thing.) With more than 30 years of dealing with Obeid, Syria’s proxies in Lebanon find him more reliable and predictable than Sleiman. Moreover, Obeid has reportedly given Damascus a written commitment that, as president, he will find bureaucratic ways to thwart the tribunal, by starving it of resources, preventing the handover of suspects or witnesses or evidence, etc. “Obeid told the Syrians that the tribunal will come into effect when Rustom Ghazeleh is 80 years old.” 13. (C) The Obeid candidacy will remain hidden until the opportunity presents itself to elect him, Murr claimed. The fact that Obeid does not need a constitutional amendment helps pave the way, since March 8-Aoun would not have to recognize implicitly the authority of the cabinet (which must prepare a constitutional amendment) in electing Obeid. Even though the March 14 Christians and Walid Jumblatt are adamantly opposed to Obeid, Saad Hariri, eager to become PM, might be tempted, especially as Rafiq Hariri’s widow Nazek likes Obeid. Hariri, Berri, and Hizballah could muster sufficient votes to get Obeid elected, Murr speculated. Even Michel Aoun, if he sees he will never become president, would prefer Obeid to Sleiman, since Obeid would be unlikely to draw supporters away from Aoun’s orbit. 1. (C) Former Foreign Minister (and eternal presidential aspirant) Jean Obeid believes the national dialogue effort will founder unless regional assistance is provided on the two critical issues: the fate of President Lahoud, and disarming Hizballah. According to Obeid, Lahoud will not resign the presidency without acquiescence from the Syrian regime, and Hizballah has little room to maneuver on its arms without consulting Iran. Although the dialogue is a very real achievement and can be used as a platform to continue the consensus-building process, Obeid believes it cannot deliver unless Saudi Arabia and Egypt pressure Syria and the rest of the international community pressures Iran. In his view, the key to progress in Lebanon is the constitutional removal of Lahoud (and, presumably, Obeid’s own ascendency to Baabda Palace). End summary. 2. (C) Jean Obeid, who was Lebanon’s foreign minister in 2003-2004 during the last government of Prime Minister Rafiq Hariri, met the Ambassador and poloff on March 7 in his office. Obeid, a long-shot (except in his mind) candidate for president, worked closely with the Syrian regime during his time in office. But he is also generally regarded as an honest politician who has few enemies. Unlike many other Lebanese politicians, he does not attempt to hide his past affiliations with Syria, and in fact can be relied upon to give a fairly straight-forward analysis of their intentions, capabilities and weaknesses. Speaker (and national dialogue sponsor) Nabih Berri has previously mentioned Obeid as a presidential candidate, but this endorsement — which doesn’t exactly win Obeid many othe friends– is relatively isolated. Obeid does not enjoy a great deal of support in the Maronite community. 3. (C) In Obeid’s opinion, the national dialogue conference (currently on hold until Monday, March 13) is a useful step forward, but the 14 participants at the table understand that without regional assistance/acceptance on some issues, it will soon break up without solid agreements. He explained that the “international umbrella” offered by UNSCR 1559 has permitted the discussion of previously red-line issues, but what is actually needed at this point is indirect participation by either Saudi Arabia or Egypt to gain regional acceptance of dialogue solutions. Specifically, Obeid contended that the issue of Lahoud’s removal and selection of his successor could not be realized without the acquiescence of Syria — that is, the Asad regime would never allow Nasrallah to accept a candidate openly hostile to it. Likewise, he believes the issue of Hizballah’s arms is also controlled by a regional force, namely Iran. Although the open relatively open exchange of positions in the dialogue is a positive development, Obeid is convinced that by itself, the talks will likely break up in the coming week. 4. (C) The former foreign minister argued these two issues (presidency and disarmament) had to be addressed in sequence. The primary objective, in his opinion, must be a change in the presidency — but to a president whose policies could be reliably predicted by both internal political forces and neighboring countries. Obeid said his long experience with the Syrian regime (he claimed to meet often with former Syrian Vice President Abdelhalim Khaddam and Bashar’s father, Hafez Asad) led him to believe that, even if Syria’s primary aim to reassert control over Lebanon is thwarted, the regime would never permit the selection of an anti-Syrian Lebanese president — they would unhesitatingly and rapidly create instability to prevent that development. But, according to Obeid, they are now under severe pressure and could be convinced to give up on Lahoud and accept a “neutral” president. He argued this is where President Mubarak and King Abdullah could play a decisive role and allow the dialogue to achieve its primary objective — the removal of Lahoud, and its liberating effect on Lebanon’s political and economic progress. 5. (C) Obeid is convinced that without the acquiescence of the Syrian regime, Lahoud will remain until the last day of his extended term. He stated, “Lahoud entered the (extended) presidency of his own accord, but he is not free to leave without Syria’s permission.” According to Obeid, even the Maronite patriarch could not convince Lahoud to resign, BEIRUT 00000714 002 OF 002 because without Syrian concurrence, Lahoud would be killed. 7. (C) The ever-hopeful presidential candidate stated that the opening of the national dialogue was in itself a considerable achievement. He described the “culture of divergence” that had been growing with each passing week as sectarian leaders attacked each other and issued ill-conceived ultimatums. That being the case, Obeid expressed mild surprise at the apparent civility of the current discussions and said that perhaps a new way of handling differences was slowly emerging. If nothing else, the dialogue had created a “new base” for handling divisive issues. 8. (C) The former minister reiterated that the dialogue still had a chance to accomplish its most important objective — a constitutional change in the presidency — if regional (i.e. Syrian) acceptance could be engineered. 9. (C) Obeid (with some obvious self-interest) argued that an Aoun presidency would not be a positive development. Aoun’s temperament, sense of entitlement, and lack of (civilian) leadership would inevitably produce tension and impede critically-needed progress. In Obeid’s opinion, Berri and Nasrallah could persuade the former general that he lacks the necessary support, but it would be a difficult task. Aoun understands that he will never have the support of Jumblatt, Ja’ja’, and probably Hariri and the Maronite patriarch. Therefore, if he can be convinced his other path (Shia support) is not available either, he would have to (“if reasonable”) accept the inevitable. 1. (C) Ex-Foreign Minister and Presidential hopeful Jean Obeid attributes Lebanon’s problems to external forces and to the inadequacy of current leaders in Beirut and Damascus. Citing a Shia-Sunni conflict spanning the entire Muslim world, Obeid espouses a neutral Lebanese presidency allied with neither sect. Not coincidentally, this is the latest position emphasized by the Maronite Patriarch, with whom Obeid has been strengthening his relations recently in an attempt to overcome his pro-Syrian past and become that “neutral” candidate. End Summary. 2. (C) The Ambassador called November 15 on Jean Obeid, a former Maronite MP from Tripoli who served as Foreign Minister under the last Rafiq Hariri government. Obeid once boasted of close ties to the Syrian regime, but it appears that he may have fallen out of favor in Damascus for reasons that are unclear. He has made the best of this reversal of fortunes by positioning himself with the Maronite Patriarch and others as a “neutral” presidential contender. Obeid is the uncle of current Finance Minister Jihad Azour and a relative of American lebanese Chamber of Commerce (AMCHAM) President Salim Zeenni. 3. (C) Obeid’s message stressed the regional dimensions of the current Lebanese political crisis. Known as an “Arab nationalist,” he repeatedly pointed to the Sunni/Shia conflict raging “from Afghanistan to Mauritania.” The Israeli-Palestinian conflict, Iran’s regional and nuclear ambitions, and Syria’s greed for Lebanon all feed into Lebanese domestic political strife. “Some Lebanese are adding to the conflict,” he added. The question is how to isolate Lebanon from this vast conflict, not involve Lebanon in it. However, there is a lot of Sunni and Shia money flowing in from outside which fuels the sectarian conflict in Lebanon. 4. (C) In his new guise as a centrist, Obeid had criticism for all parties. “The minority has no patience and the majority has no modesty,” he said. Obeid criticized what he sees as the tendency of the majority — i.e., March 14 — to make decisions unilaterally without adequate consultation with other parties. Prime Minister Siniora, he said, does not spare the time to contact and consult other government figures, as compared with Rafiq Hariri, who was in frequent contact with officials at all levels including mayors. Obeid claimed to have told Siniora, “Don’t expect the U.S., France and Saudi Arabia to do your work for you” in settling issues with other Lebanese parties. Siniora will have to do more himself. As for the U.S. role, Obeid recommended that any initiatives or positions taken by the USG be presented as Lebanese policy, rather than USG policy. 6. (C) If the majority needs a spirit of modesty and inclusiveness, he continued, the minority — i.e., Hizballah, Michel Aoun’s Free Patriotic Movement, and other pro-Syrian groups — needs patience. “They don’t take into consideration that there was an election.” The minority’s backers, Iran and Syria, are becoming more strident in their demands, not more reasonable, and their relative power is increasing. Lebanon is heading toward more violence, he gloomily asserted. 7. (C) Lebanon needs to guide its Shia river into the BEIRUT 00003657 002 OF 002 Lebanese sea, he added. Hizballah is strong toward outside threats, like Israel, but weak or inept toward internal Lebanese parties. 8. (C) Obeid turned on President Lahoud and his apparent position that Christians are part of a Christian-Shia axis confronting Sunni and Druze. While these alliances may shift, they are always bad for Lebanon. The Lebanese president, he said, should play the role of a bridge between confessional groups. If two out of Lebanon’s three largest groups line up against the other, there will be continuous war. Obeid praised the Patriarch’s position that the president must lead Lebanon’s Christians out of sectarian strife. The Patriarch does not want Christians to fight Christians nor Muslims to fight Muslims. 9. (C) Michel Aoun, he added, does not comprehend the mind of Christians. Samir Ja’ja’ does not comprehend the heart of Christians. President Lahoud is feeding the flames and creating walls, not bridges, between groups. Lebanon cannot be safe with a president who is part of a Christian-Sunni or Christian-Shia axis. Lebanon also cannot afford a President who is either an agent or an enemy of Syria. Posted in Politics, The WikiLebanon Files, WikiLeaks on March 31, 2016 by Ramez Dagher.